Ordinance No. 01, Series of 2014 - Ordinance Imposing a Fee on Research and Inspection in real Properties. Ordinance No. 12, Series of 2013 - Ordinance Amending Rates and Guidelines of the Vigan Convention Center. Ordinance No. 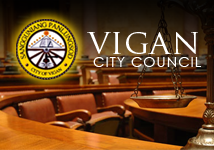 13, Series of 2013 - Ordinance Amending Legislative Processing Fee in Vigan Revenue Code as Amended. Ordinance No. 27, Series of 2014 - Ordinance Amending Section 291 Meat Inspection. Ordinance No. 2, Series of 2005 - Transfer of Funds Under trust fund to the General Fund. Ordinance No. 2, Series of 2008 - Adopting the New Schedule of Values for Lands and Buildings. Ordinance No.4,Series of 2007 - Amending the Revenue Code of Vigan. Ordinance No.6, Series of 2006 - Revenue Code of the City of Vigan as Amended. Ordinance No.8, Series of 2007 - Authorizing Mayor and Vice Mayor to Augment any item in the Approved Annual. Ordinance No 10,Series of 2008 - Establishing Price List of Products at the Productivity Center. Ordinance No.20,Series of 2008 - Amendments to the Price List of Products at Productivity Center.